Universally acknowledged as a leader and innovator within the Australian industry, the Farrell family’s Mulawa Arabian Stud is one of the most respected, enduring and accomplished breeding, training, show and performance programs in the country. Now embarking on five decades of involvement with and dedication to the Arabian horse, the Farrells can proudly celebrate eight successive generations of vision, achievement and results. The story of Mulawa is one of passion and vision, of purpose and ambition, of authenticity and integrity — a story that began with a young man’s desire to own an Arabian horse. That young man was Greg Farrell Jr., whose dream was realized in Cassanova, a small, unassuming, grey Arabian stallion. Cassanova became a part of the family in the early 1970s while Greg was still in his early teens. Little did anyone realize at the time what a pivotal role he would play in the Farrell family’s life. With the support of his parents, Greg Sr. and Dolores, older sisters Julia and Deborah, twin brother John, and younger sister Jane — Greg and Cassanova evolved from an eager trail riding team into aspiring local endurance competitors. Quality of life, for horses and humans, might just as well be the Mulawa mantra. It is evident in the fabric of daily routine at every level of the program. Greg and Julie are the heart and soul of Mulawa. “I first met Julie when I sold her a horse, which she resold for more money! I knew then she was special!” says Greg. Julie was born in the UK and moved with her family to New South Wales at the age of 12, bringing with her a lifelong passion for horses. Joining them in charting the ongoing success of the program as full partner is Jane, a beacon of positive energy and the cheerleader for all things Mulawa. In the course of five decades, Mulawa has evolved from family farm to formidable force within the Australian Arabian industry, breaking records, setting standards, providing leadership and defining a foundation of excellence that has bettered the industry from top to bottom. Championships have been garnered at every major show across the continent as Mulawa-bred horses dominate in hand and under saddle. Aside from all the showring glory the Mulawa horses have attained, the Farrells are in agreement about the greatest rewards of their involvement with the breed. “The sharing of goals, effort and desire as a family is enriching,” says Jane. “Our father’s willingness and confidence in backing the judgment of a then teenage Greg was wonderful to witness as they worked together building the farm. Now to watch Julie and Greg help Kate in her endeavors is great to watch, and GJ enjoying farm pursuits makes for great family time. We always enjoy our wins because horses, despite their apparent strength, are fragile animals – we never take anything for granted." Faithfully stewarding the Arabian breed now for nearly five decades with passion, integrity and dedication, the Farrell Family and Mulawa Arabian Stud have charted an ambitious, progressive and ever-evolving path towards success – for themselves, for the worldwide industry and for the breed and the horses they love. We can look forward to the next chapter of this inspiring saga with great anticipation and shared rewards for all. 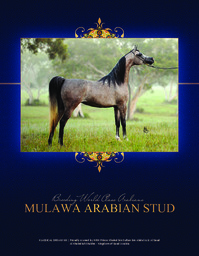 The Mulawa Arabian Stud story was featured in the August 2009 issue of the Arabian Horse World and again in a brochure distributed at the Scottsdale Arabian Horse Show in 2014 . Click on the images or the text below to read the features in full and download the PDFs.